Looks like a watch, acts like a smartwatch. The Fossil Smartwatches hybrid smartwatch blends analogue design with smart connectivity. With smart technology, this stylish wrist essential is always on, always connected with a battery life up to six months (based on usage). Using Bluetooth technology, receive smartphone notifications and accomplish daily fitness goals when the hour, minute and sub-eye hands spin or the watch case vibrates. Set an alarm, compare time in multiple time zones and track everything from steps to calories to sleep. Press the bottom pusher to take a photo, control music or find your phone with the help of our Fossil Smartwatches App. Customise your look with interchangeable straps. 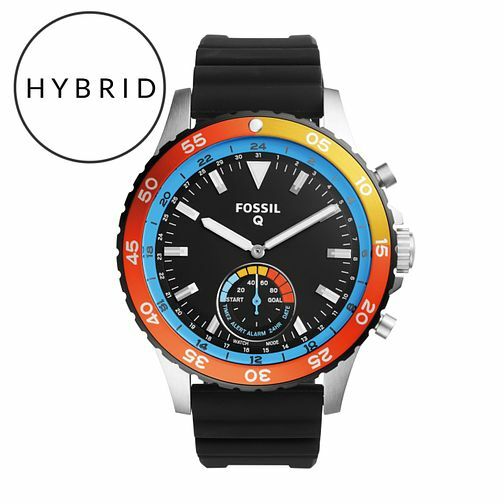 It's easy to keep your world curious with Fossil Smartwatches Hybrid watches.